MODU-FLEX modular trolleys with roller shutter are available in 90 cm, 105 cm, 150 cm and 185 cm high. The roller shutter can be locked with a key lock, code lock or a badge reader. The width of these MODU-FLEX modular trolleys can vary between 40 cm, 60 cm, 2x40 cm, 2x60 cm and 3x40 cm. They are equipped with modular liners so they can fit our modular trays and baskets of of 5 cm, 10 cm and 20 cm deep. The liners allow the modules to be placed in 3 positions: horizontal, slant and tilted. The MODU-FLEX accessory clamps offer multiple possibilities to easily attach various accessories to the carts: push handles, accessory rails, extension units, waste bag holders, risk waist container, IV pole, accessory frames, laptop holder, etc. By default, each cart carries 4 double and dustproof swivel wheels with a diameter of 100 mm, two of them with brake. 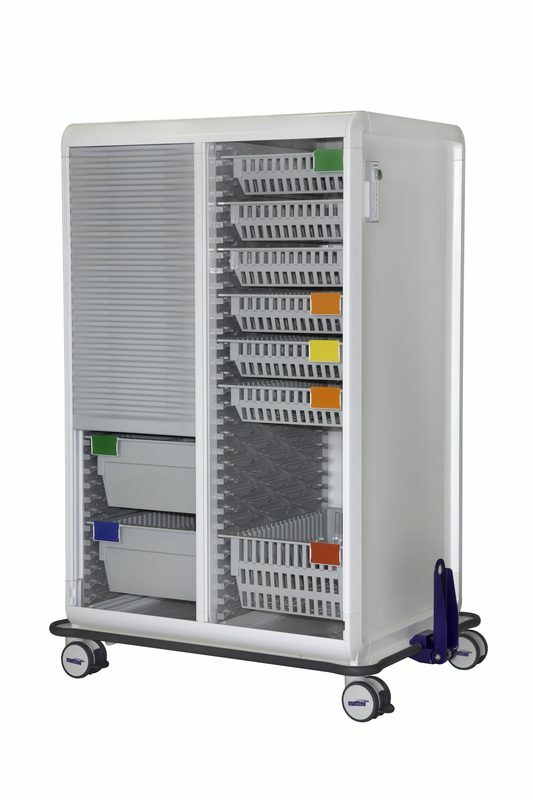 The MODU-FLEX modular trolleys with roller shutter are available in both Flat Top and Round Top version. The worktops of these carts are available in different materials: HPL, epoxy coated steel, stainless steel and plastic. They are available with raised edges on the 3 sides, or completely flat and can be installed directly on the carts or floating with 4 accessory clamps. You can find more information in the catalogue download below.